Growing up in the UK we are exposed to many different types of food choices. Many that are unknown outside of the UK. The most known British cuisine would be fish and chips. You can find a Fish and Chip shop on most high streets throughout the UK. 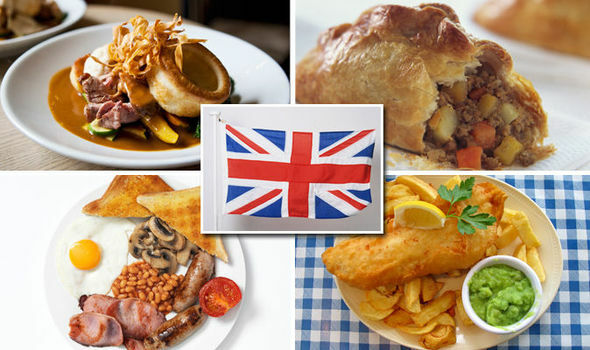 After some research I think it’s best to breakdown this topic into a series of articles about British food. Breakfast, lunch, dinner and desserts. Breakfast is the first meal of the day so let’s start from there. The photo above is a traditional “fry up”. Usually a “fry up” is eaten on a Sunday morning after drinking the night before, however some people eat this kind of breakfast everyday. A “fry up” is basically all fried food. Another name is the Full English Breakfast. This is grilled bacon, fried eggs, beans, bread, tomatoes, sausages and mushrooms. British people have their own individual way of making this breakfast. This way is just an example. A quick breakfast that is popular is a “Bacon Sarnie”. Traditionally eaten with brown sauce or ketchup. Another more simple name would be a bacon sandwich. The bread is sometimes warmed up to have a more crispy texture. Crumpets are another famous food that British people eat for breakfast. Usually cooked on one side and then butter is spread over the top. The texture is very soft and a little oily because of the butter.